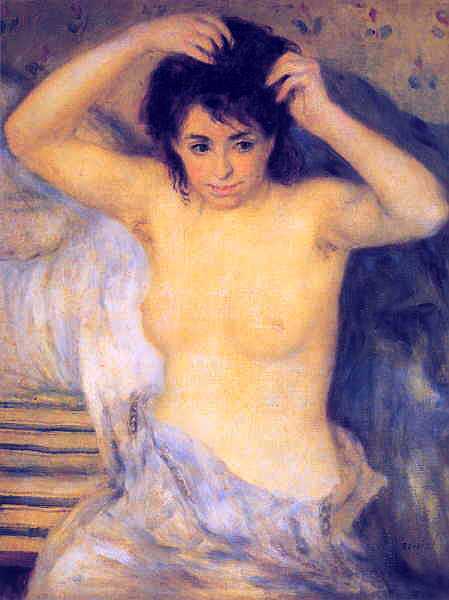 Renoir, Pierre Auguste , 1841-1919, French impressionist painter and sculptor, b. Limoges. His early work reflected myriad influences including those of Courbet, Manet, Corot, Ingres and Delacroix. Simultaneously he developed the ability to paint joyous, shimmering color and flickering light in outdoor scenes such as The Swing and the festive Moulin de la Galette. 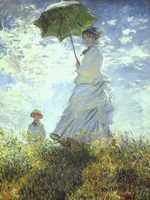 He had gone beyond impressionism. His ecstatic sensuality, particularly in his opulent, generalized images of women, and his admiration of the Italian masters removed him from the primary impressionist concern: to imitate the effects of natural light. After a brief period, often termed harsh or tight, in which his forms were closely defined in outline (e.g., The Bathers, 1884-87; private coll. ), his style of the 1890s changed, diffusing both light and outline, and with dazzling, opalescent colors describing voluptuous nudes, radiant children, and lush summer landscapes. Among his most celebrated paintings are: Luncheon of the Boating Party (1881; Phillips Coll., Washington, D.C.); Dance at Bougival (1883; Mus. of Fine Arts, Boston); Lady Sewing (Art Inst., Chicago); and Bather (1917-18; Philadelphia Mus. of Art).